The helicopter nestles into the natural forest opening atop a ridge in British Columbia’s Gilnockie Provincial Park. As the rotors slow, biologists and BC Parks staff jump out and start gathering gear. The plan is to bushwhack our way downslope and intercept a small tributary stream, then follow it to the valley bottom where the helicopter will pick us up. Then we’ll do it all over again with another stream. The goal is to determine whether the stream is home to a cryptic, little-known amphibian that lives in a few small mountain streams in B.C.’s Kootenays – the Rocky Mountain Tailed Frog. The frog is listed as threatened under Canada’s Species at Risk Act and blue-listed in B.C., therefore protected habitat is important to its future. 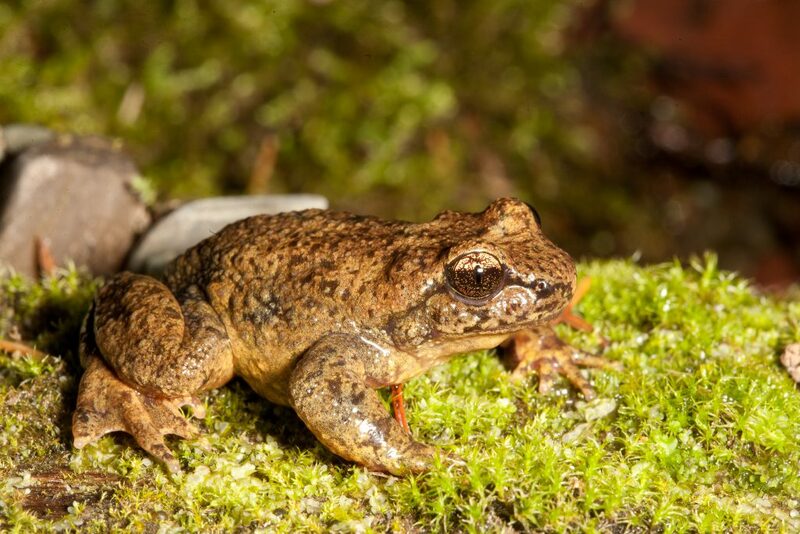 If it is here, Gilnockie Provincial Park (located southeast of Cranbrook) will be the only formal protected area in British Columbia – or all of Canada for that matter – to include Rocky Mountain Tailed Frog on its species list. 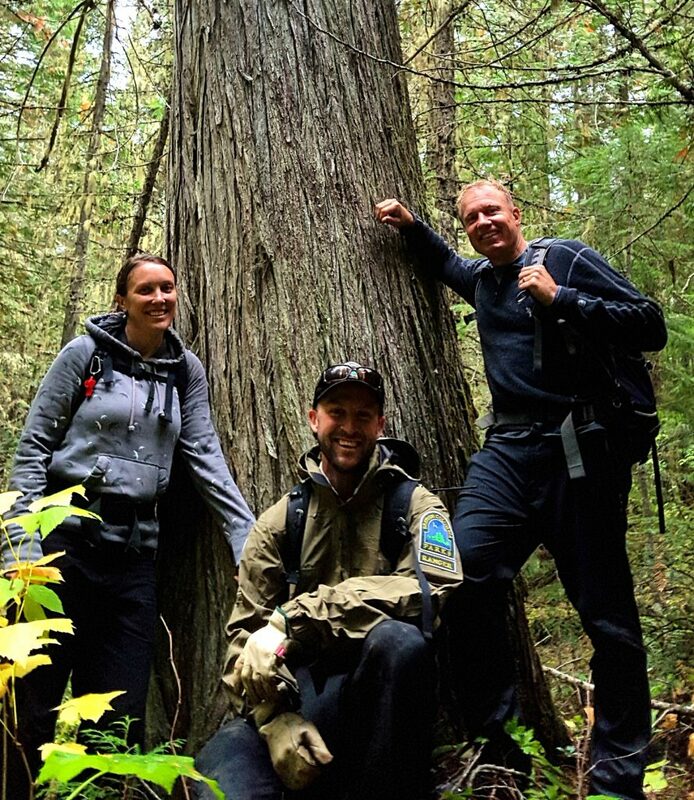 Amanda Weber-Roy, Craig Browne and Jared Hobbs in Gilnockie Provincial Park. Photo by Ian Adams. Hobbs is a leader of environmental DNA, known as eDNA, in British Columbia. The method involves sampling streams, lakes or rivers to collect tiny bits of exogenous DNA free-floating in the water. Remarkable advances in genetic testing allow biologists to test those samples for the DNA from a given species. If their DNA is present, it’s a virtual lock that the species is there to slough it off into the water. If the species is not present in the water, there is no DNA to amplify and the test is negative. But getting to the streams in Gilnockie is no walk in the park. Gilnockie Provincial Park was created in 1995 and protects old forests that are highly diverse for the East Kootenays. Large Douglas fir, western larch, and western redcedar grow on steep slopes, joined by spruce and hemlock in the cool, damp valley bottoms. On the ridgetops, natural openings are interspersed with pine forests and natural high elevation grasslands. 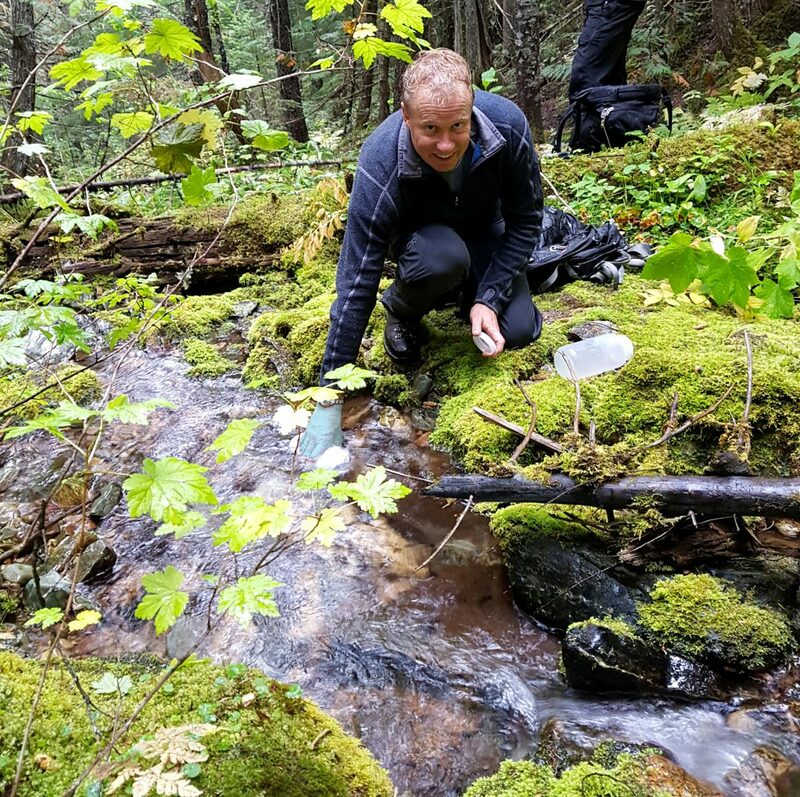 Jared Hobbs samples a stream in Gilnockie Provincial Park for Rocky Mountain Tailed Frog eDNA. Photo by Ian Adams. Because its management objective is primarily environmental protection, there are no roads, recreational facilities or trails. This is a wilderness park. We slip and slide our way down steep slopes, clamber over windthrown trees left wet and slippery from the rain before reaching the stream. Two one-litre water bottles are carefully filled and labelled at three different sites. We see neither frog nor tadpole but that doesn’t matter. The real story lies in the microscopic particles in the bottles. Back home, the creek water is pulled through a special membrane with pores small enough to trap any DNA segments without damaging them. Once filtered, the samples are sent to Dr. Caren Helbing’s lab at the University of Victoria for testing. In early November, the lab calls and has our results – one of the three streams tested positive for Rocky Mountain Tailed Frog eDNA! Another stream may be worth looking at again because of the rain that had fallen immediately prior to our testing, which increases the possibility of a false negative test due to lower eDNA concentrations. For now though, with at least one positive test, we can say that Gilnockie Provincial Park is home to Rocky Mountain Tailed Frog. Previously, such applied ecological work rarely, if ever, occurred in BC Parks. However, new revenue provided by the BC Parks Licence Plate Program has now allowed such projects to take place. Rocky Mountain Tailed Frog. Photo by Jared Hobbs. Among the oldest known frogs in the world, the Rocky Mountain Tailed Frog branched off from a common amphibian ancestor almost 250 million years ago. This evolutionary isolation from other frogs, combined with their mountain stream habitat, has left them with some unique adaptations. Rocky Mountain Tailed Frogs are the only frog in North America that does not vocalize. Only males have the “tail,” which is used for reproductive purposes. They are also the only amphibians to utilize internal fertilization because external fertilization of eggs (as all other frogs do) just wouldn’t work in a fast-moving mountain stream. The first requirement of tailed frog habitat is permanent water, but not all side streams flow year-round. Unlike other frogs whose tadpoles metamorphose into adults within months of hatching, Rocky Mountain Tailed Frog remains a larval tadpole for at least three years. Even after metamorphosing to adult form, tailed frogs don’t breed until age seven or more. Such long-lived, slow reproductive strategies are very rare in amphibians and contribute to the challenges of their conservation. For the tadpoles, it means that streams must remain watered year-round or they will not survive. In the past five years, Hobbs and I have found Rocky Mountain Tailed Frog in five previously unknown East Kootenay watersheds using eDNA. Without the genetic testing, it’s unlikely any of these populations would have been found, but we can now add Gilnockie Provincial Park to the list. Ian Adams is a Registered Professional Biologist based in Cranbrook, BC. Other major funding for the Rocky Mountain Tailed Frog eDNA project has come from BC’s Forests, Lands, Natural Resource Operations and Rural Development’s Land Based Investment program and Columbia Basin Trust.